A home run for the Republicans lies behind us. Over a year of presidential campaigning has come to an end, and the big hit of the day is Donald Trump. He is proving latest polls wrong – even though Hillary Clinton gains the popular vote – the rest is over. Trump wins the electoral vote and the republicans win the majority of seats in the senate and the House of Representatives. 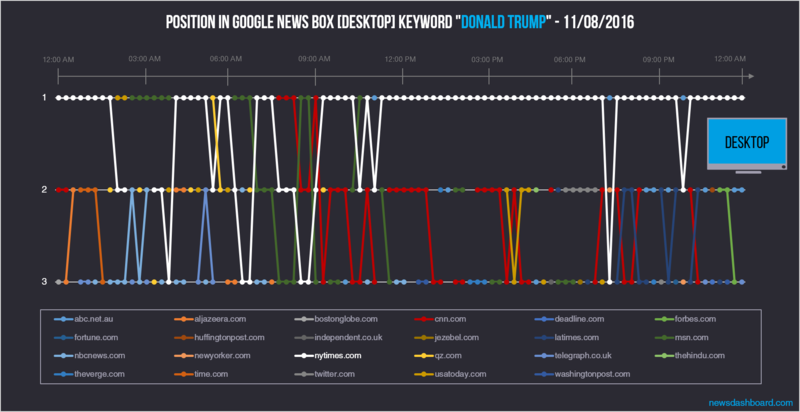 We analyzed how the publishers performed in the desktop and mobile Google News OneBoxes at the Election Day and the day after. We have covered all the bases with this updated keyword set for this final match. Throughout the first, second and third presidential debate we have continuously worked on our keyword set. While for the third presidential debate we had a keyword set consisting of 43 keywords, we now have a keyword set with a whooping 104 keywords. The set incorporates the areas of election results, swing states, flip states, other states, candidate specifics, including all the well-known scandals around Trump and Clinton, candidates for the vice presidency, former candidates, third parties and third party candidates, voter specifics, different kinds of coverage, pre-election polls, ballot initiatives and everything else around the election that is important. As for all our analyses you can find all mentioned keyword sets at the end of the text. This analysis concentrates on the Election Day and partially on the day after. We will go into a lot of different layers, starting at the basic level of top 10 most visible publishers in the Google News Boxes and Carousels for desktop and mobile for 11/09 and 11/08. Thereupon, we direct our attention towards the flow of the changing positions throughout Election Day in the Google News Boxes for desktop for each candidate. Afterwards, we have a new view on our data. For this grand finale, we will be looking deeper into the visibility for the swing states that had the most likelihood of tipping the Electoral College – Florida and Pennsylvania. We will evaluate the top 3 publishers for a mini keyword set for each state – there are some surprises awaiting us here. NYTimes and CNN leading, Fivethirthyeight beating LA Times and CBS News in the desktop visibility for the election. 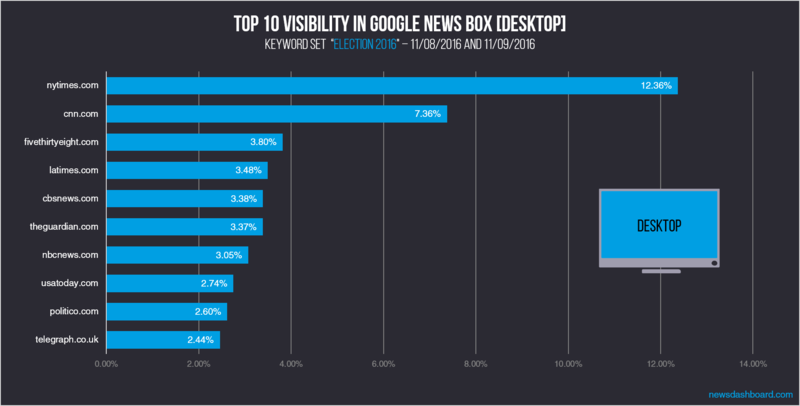 Let us now take an expanded view at our first graphic, the comparison of the top 10 publishers for Google News Boxes visibility for the big keyword set. As we have seen before nytimes.com is first with visibility of 12.36 percent, compared to CNN‘s 7.36 percent. So cnn.com has a strong rival for desktop visibility. All other contenders are below 4 percent visibility. In the top 5 we have fivethirtyeight.com with a visibility of 3.80 percent. A participant that has not been so strong in last analyses before, so we have to quickly dip into the likely reasons for that. They had a live election forecast and a whole lot of other coverage – playing a strong card in this highly trafficked time. Next are latimes.com with a visibility of 3.48 percent and cbsnews.com with a visibility of 3.38 percent. Competitors still above 3 percent are theguardian.com and nbcnews.com. Competitors below 3 percent visibility are usatoday.com, politico.com and the British telegraph.co.uk. Some surprises on the picture for the visibility in the the Google New Box Carousels. Now to the analysis for Google News Boxes and AMP Carousels for mobile. As we have seen throughout the whole campaign, cnn.com is once more our gold medalist with a visibility of 5.19 percent, but usatoday.com is a close runner up with a striking 4.44 percent visibility and less than 1 percent lower than CNN. The last place on the podium goes to washingtonpost.com with a visibility of 4.02 percent and right behind, actually equal is nytimes.com – with a difference of hardly 0.02 percent. As always, we have a close knit field in the mobile division. The places 5 to 10 are in order: relaymedia.com, cbsnews.com, nbcnews.com, heavy.com, timeinc.net, cnbc.com. Our surprise is relaymedia.com on fifth position. Relay Media is not a news publisher, but an AMP service provider for publishers, so behind their result are several other publishers who use the service of relaymedia.com. Looking further into our data we can see that publishers like Miami Herald, KCRA, Kansas City Star, The Charlotte Observer, The Daily Dot and others are behind the Relay Media links. In comparison to the desktop results we see some of the same players, but in a different line up, in the top 10 – these are cnn.com, usatoday.com, nytimes.com, cbsnews.com and nbcnews.com. Astonishingly washingtonpost.com is solely in the top 10 for mobile visibility where they are always going to strong, equal to nytimes.com, who score much higher for desktop visibility. Furthermore, the difference in the mobile visibility is elementarily lower compared to the desktop results, partially attributed to the higher amount of ranking positions possible in the AMP Carousel. 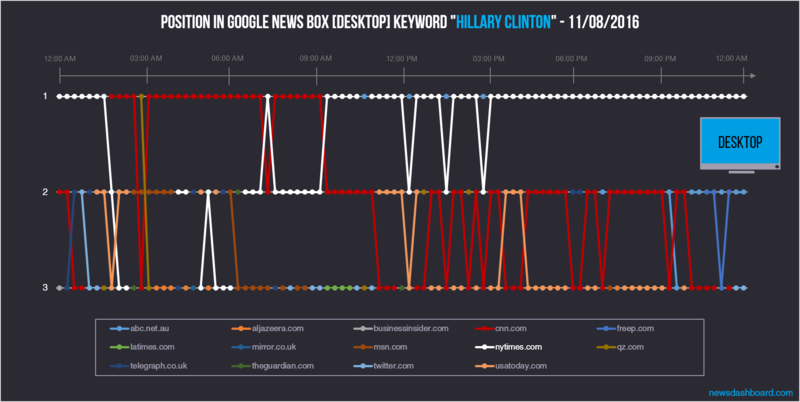 cnn.com and nytimes and usatoday.com as the most visible publishers for Hillary Clinton in the Google News Box on Election Day. Nytimes.com and cnn.com ranking top in the Google News One Boxe for most of Election Day. Next to Hillary Clinton there is of course Donald Trump, now president and a highly searched keyword on Google through the months. Again we have nytimes.com in the top 3 nearly throughout the whole day and on top after 9 am, pretty remarkably so. Latimes.com, cnn.com, nbcnews.com, msn.com as well as the British telegraph.co.uk are also a lot of times visible in this particular News Box throughout the election day. But as we see most competitors are not visible for very long before losing their position. At this point in the analysis we want to present you a new approach to our data. As we can see there are various levels on which you can get new insights into Google News for desktop and mobile and hence can refine your SEO strategy for Google News with the News Dashboard. This time we direct our attention towards two keyword sets for the swing States Florida and Pennsylvania. As America awaited the election results all eyes were on the color of these yet undecided states and consequently on America’s future. So there was a big user interest here. 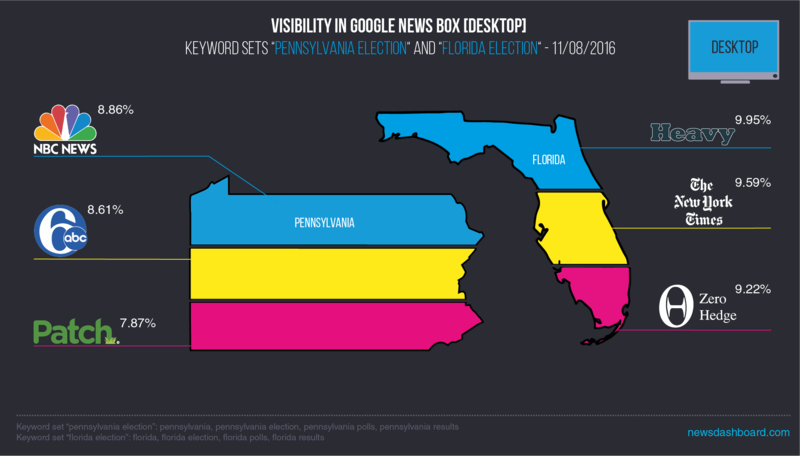 Totally different publishers for the keyword sets – “pennsylvania election” and “florida election”. So our last look goes to data for the keyword sets around Florida and Pennsylvania as we have established above, maybe the most important key states in the election results. As you can see we have a small comparable key word set for both of them, each consisting of four words. You now look at the more diverse desktop results. For Pennsylvania we have the big nbcnews.com as the gold medalist. Next, we have some normally not so visible publishers 6abc.com and patch.com – and all are very close around the 8 percent mark. For Florida we have a different array of publishers – all extremely close as well. Here, heavy.com is able to beat the big publisher nytimes.com. Last publisher on the podium is zerohedge.com, commonly known for their finance and economy news. 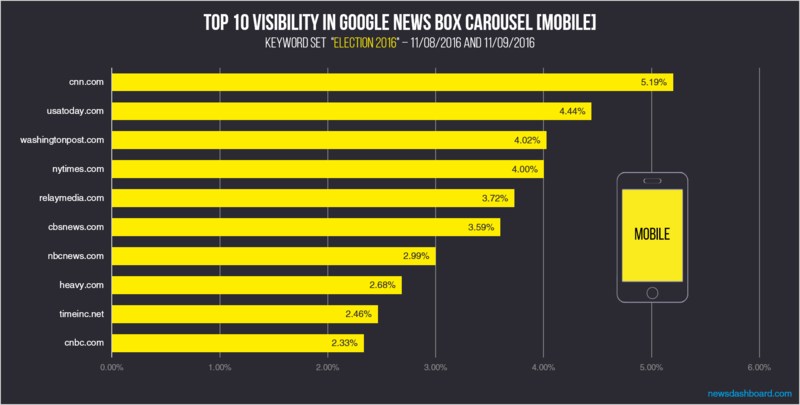 Summarizing all the different layers of our analysis we can say the following: The results concerning the visibility in the Google News One Boxes for desktop and mobile Carousels for the general keyword set are not as surprising as the election results themselves. Nytimes.com and cnn.com are very strong publishers overall and this fits to our pre election analyses. Our two daily analyses for the candidates as keywords also clearly show dominant rankings for them in the most interesting day times. If we look into details the picture as a whole gets a bit more differentiated. Especially as the mobile SERP is concerned there is some movement and when it comes to the analysis of the swing states one can see that also the non-dominant players each have their niches.